Back in September my friend and quilting mentor, Gwen Marston, gave me a most precious gift. Gwen is well, but said she's having a little bit of arthritis and needs to back off hand quilting. She is using her trusty old Singer machine for quilting her quilts now and has passed her quilting frame to me. 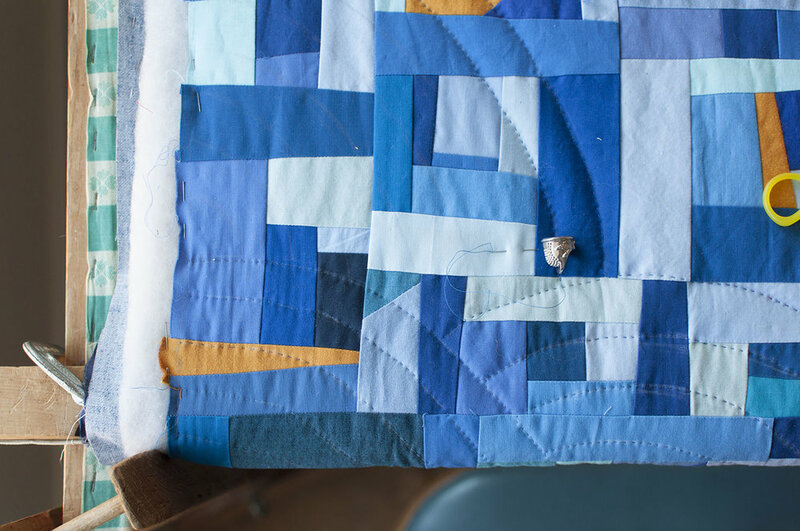 She purchased the frame in the 1970s, and said this about it, "The legs that hold the quilting boards were made by the husbands of the Mennonite quilters that taught me to hand quilt and all of my quilts have gone through that frame since day one. In my work that frame was indispensable!" She said giving me her quilt frame is like The Changing of the Guard and so now it's my turn. 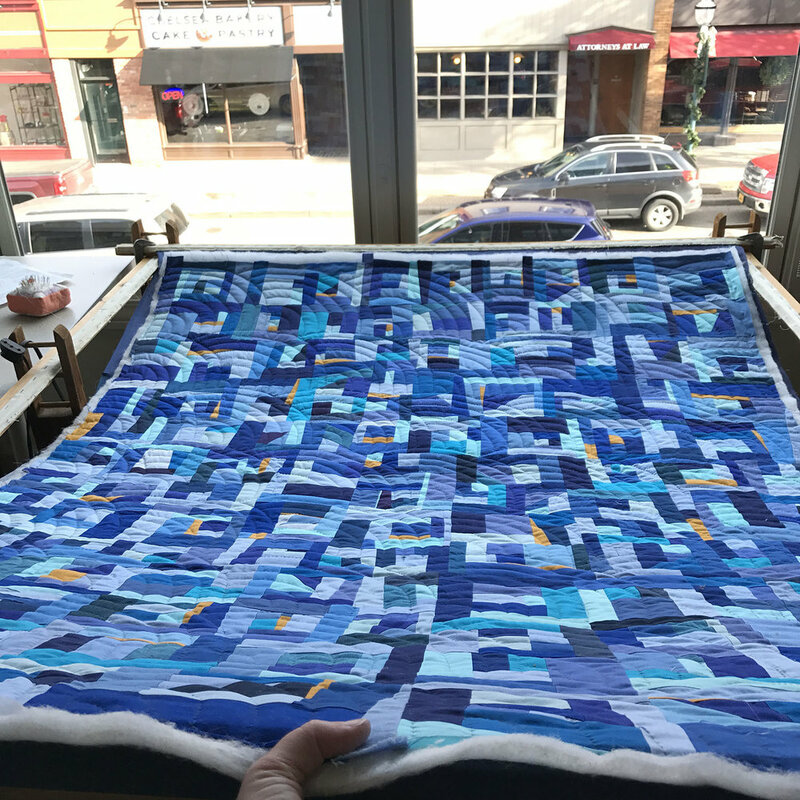 In this frame, the whole quilt is stretched flat between the boards. First the backing, then the batting, and the quilt top is layered and pinned on top. You quilt what you can reach from the edge and then roll the quilt on the end bar and reclamp it to stitch the next area. As you quilt, the frame takes up less space in the room. The parts that you have quilted are hidden from view until the whole quilt is finished. I quilted this quilt with free drawn fans and purposely wanted them to look unique and not like they were drawn with a template. As I was progressing on the quilt I feared that my repeated markings had gotten too even and I worried it would look too controlled. On the last few passes I really tried to make them look like fans but not all the same. Unrolling the quilt for a full view was quite exciting! The quilt looks strangely tiny in this photo. This is the first in what I hope will be many quilts stitched sitting at this frame. I love the slower pace of hand quilting. It allows me time to think about all the joys in my life, to plan family activities, and even ponder upcoming quilts. I also have been listening to recorded books while stitching. Thank you, Gwen, for trusting me with this treasure.